If you're looking for a fun and crafty way to create unique garden lanterns then you'll love this project. Let me show you how to transform empty wine or water bottles into these lovely lanterns. They're super easy and are sure to impress guests at your next garden shindig. Note to crafters: I found my bottle cutter on-line at Amazon.com. The rest of the supplies, with the exception of the sticks and bottles, I picked up at my local craft and hardware stores. Probably the most challenging part of this project is removing those darned labels from the bottles. My solution is simple...soak the bottle in dish detergent for at least 2 hours and with some coaxing, they come right off. Using a magic eraser also works. To cut the glass, simply follow the directions supplied with the bottle cutter. And, don’t forget to wear safety glasses for this project. It’s also important that you file the edges of the cut glass with a glass file. 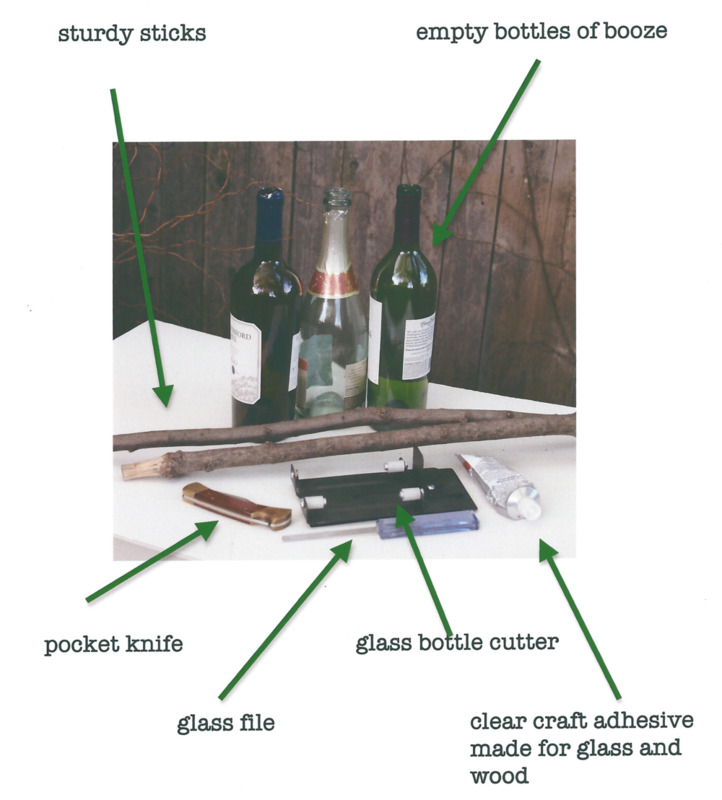 Using the pocket knife whittle (I love that word) the top of the stick to accommodate the opening of the glass bottle. Place a generous portion of glue on the top of the stick and place the opening of the bottle on the stake and let it dry over night. My adhesive of choice is E-6000. If you don't want to use sticks, you can substitute by using garden stakes which you can buy at any garden center. Here's a photo of an outdoor wedding which I used them to line the isle; added a bit of ribbon and viola'! Don't forget to recycle the bottom portion of the bottle for a drinking glass or vase. However, remember to file down the sharp glass edges before use. Not only can you put a votive candle inside but also you can fill them with birdseed or flowers. Enjoy your party and happy crafting!